Haidian was originally a village outside Beijing, but during the Qing Dynasty the Old Summer Palace was built here. In the early 20th century, Qinghua University broke ground in Haidian and other universities followed suit. 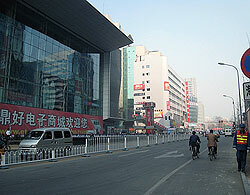 After the formation of the People’s Republic, Haidian district became known as the “University District”. It is also the centre of China’s IT industry. Its student and techie population has turned Haidian into a hip area. The heart of Haidian lies near Wadaokou Station, where there are numerous restaurants, cafes and bars with student-friendly prices, as well as apartment buildings and movie theatres. Korean restaurants seem to dominate cuisine in the area, but you can also hop over to the famous congee shop on Chengfu Road for a bowl of hot porridge with your choice of savoury or sweet toppings. Those looking for some serious shopping can head over to Xi Dan and Xuan Wu, which are packed with department stores and small stalls and shops offering bargain shoes, clothes and CDs. A walk through Peking University, or “Beida” as it is lovingly referred to, is a pleasant, peaceful experience. Its vast grounds pay tribute to Chinese architecture, as the campus teems with pagodas, gardens and many historical structures and buildings. The landscape, enveloped by the calm Weiming Lake, serves as a beautiful backdrop for the brilliant campus minds. Separated by a canal, Beida leads to the ruins of Yuanmingyuan, or old Summer Palace. Originally built during the 18th century, it was sadly sacked and burned by the British. Once referred to as the “Versailles of the East”, the grounds of this forgotten treasure still whisper its colourful history.